Baldwin Park Controversy - SPARCinLA We are SPARC: Art | Community | Education | Social Justice SPARC | Social & Public Art Resource Center | Creating Sites of Public Memory Since 1976 | Founded by Judy Baca, Donna Deitch & Christina Schlesinger | SPARC is a community cultural center that creates public art as a vehicle to promote civic dialogue, foster cross-cultural understanding, and address critical social issues. We accomplish our mission by producing, preserving and presenting community-based public art. SPARC is a facilitator Ð finding ways to tell richly textured stories that help community participants and artists achieve a measure of change and transformation. 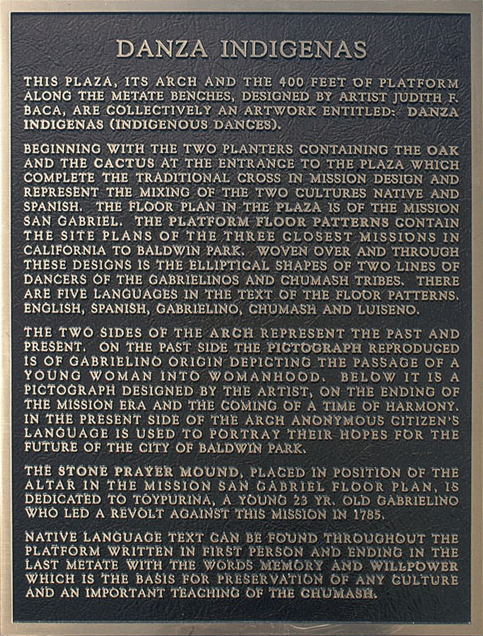 The following is a series of public statements, artworks, and publications by SPARC produced to defend the public artwork entitled Danzas Indigenas, a metro station designed by Judy Baca, SPARC’s, artistic Director, more than twelve years ago and attacked by Save Our State and The Minuteman last year. The monument was successfully preserved despite two marches by the Anti-immigrant groups and repeated demands for it’s removal. An “anti-illegal immigrant” group, Save Our State, of Ventura County, emboldened by their recent victory at the removal of a billboard referring to “Los Angeles, Mexico” is now demanding the removal of the wording on a twelve-year old monument in Baldwin Park, California, entitled Danzas Indigenas. 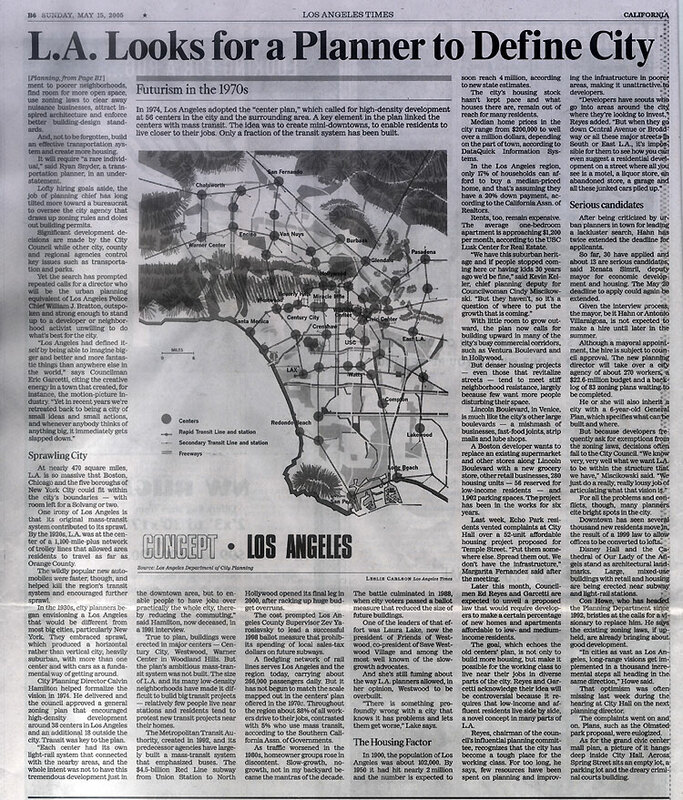 I was commissioned to produce this work in 1993 by MTA and the City of Baldwin Park in collaboration with the Kate Diamond Architectural Group. The monument consists of a 20 ft arch, 100 ft plaza and 400 ft train platform. Produced with extensive public input, the monument includes five languages: English, Spanish, Gabrielino, Chumash, Luiseño and is a layering of indigenous, Spanish and mestizo history, which is associated with the site. Included also are the contemporary voices and diversity that is indicative of contemporary Baldwin Park. Asked to produce a work that was “mission in theme” that reflected the majority population of Latinos in the City of Baldwin Park, and in keeping with my practice as an artist for inclusion of community members in my design process, I designed this work to include the “past” and “present” of the region and the voices of local residents. Of particular interest to me was the sites proximity to the mission of San Gabriel. The arch in the Plaza is conceived of as a fragment of a mission arch. 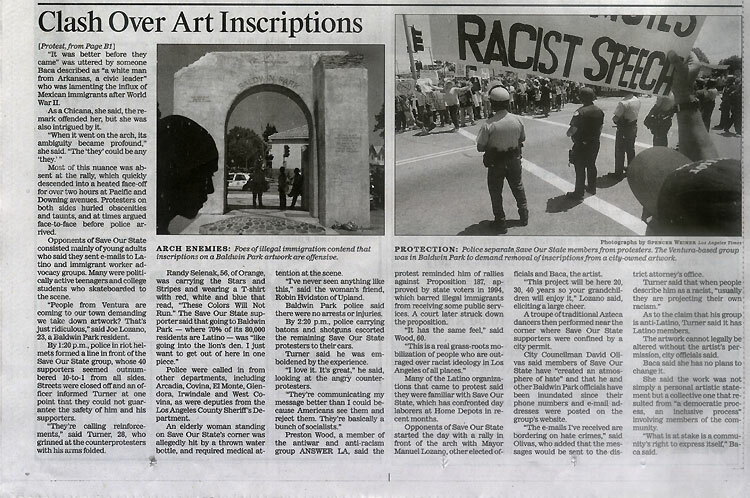 Its intention was to become a site of public memory for the people of Baldwin Park; to make visible their invisible history. Local residents sentiments were included in the “present” side of the monument, with verbatim quotes sandblasted into the surface of the arch. Local residents of all ages and ethnic groups were recommended by the arts committee and the city council and interviewed. They were asked about their hopes for the future of Baldwin Park. Additional statements from community members on the arch – which are not included in the discussion of the monument by the Save Our State group – include “Use your brain before you make up your mind”, “not just adults leading but youth leading too”, “a small town feeling”, “when the Indians died the villages ended” and “the kind of community that people dream of rich and poor, white, brown, yellow all living together”. These statements all represent the community’s desires, and are featured prominently in the work of art. The work is not a work of a lone artist working without relationship to the community, but rather a representation of community sensibilities and sentiment of the time. While this group has cast the artwork as part of a “Reconquista movement”, it is in fact neither advocating for the return of California to Mexico, nor wishing that Anglos had never come to this land. This statement “it was better before they came”, was deliberately ambiguous. About which “they” is the anonymous voice speaking? The statement was made by an Anglo local resident who was speaking about Mexicans. The ambiguity of the statement was the point, and is designed to say more about the reader than the speaker – and so it has. The quote “this land was Mexican once, was Indian always, and is, and will be again” is by a critically acclaimed Chicana author, Gloria Anzaldua. On the Save Our State website, she is referred to as a “dead Chicana lesbian.” I chose this quote because the mission is one mile from the Mission San Gabriel, and descendants of the Gabrielinos still live in the region, making Anzaldua’s text particularly relevant to the increasing indigenous population. A correct reading of the quote makes it clear that this is not about Mexican “reconquista”, but about the land returning to its origins. This is not a question only of my rights as an artist to not have my copyright violated, but also a question of “revisionist history” carved out twelve years after an extensive democratic public process produced this work. It is the collective vision of the people of Baldwin Park that is under attack by this Ventura group. What is most deserving of respect are the voices that are represented in the monument. Also deserving of respect, are the voices of the ancient indigenous who say in the first person “memory and will power” is how we retain the knowledge of our culture. Our capacity as a democracy to disagree and to coexist is precisely the point of this work. No single statement can be seen without the whole, nor can it be removed without destroying the diversity of Baldwin Park’s voices. Silencing every voice with which we disagree, especially while taking quotes out of context, either through ignorance or malice, is profoundly un-American. We have passed the socalled July 1st deadline for removing the Monumnet. It still stands, unchanged. The BP police ensured that no violence took place. This thwarted SOS’s strategy of provoking violence in order to get its television and other media coverage. The right to self determination will be celebrated anew on July 4th in Baldwin Park. At the risk of sounding parochial, we decide what is appropriate for our community and not a bunch of outsiders. “others” or “they” may find offensive? Why not reclaim the memory all the way to Madird? Why not go all the way to the “Morros” in the Middle East? do the reconquista for real. How many Hispanics will vote for that? Connect the dots . . .
I’m baffled by those who use the term “peaceful protesting” while describing Save Our State, and using words such as wild animals, barbaric behavior, coward, and terrorists when referring to counter protesters. I’ve noticed these examples here, on other message boards and in letters to the editor in newspapers. I am as equally baffled by those who continue to insist that Danzas Indigenas has racist words or implications. It takes simple reading comprehension to conclude that there are no racist words on the monument. If still in doubt, research into the history of the inscriptions on Danzas Indigenas should erase any conspiracy-type theories about underlying meanings concocted by SOS and their supporters. In addition to gleefully modeling her “undocumented boarder patrol agent” shirt while proudly ranting about how she makes and distributes these, you can watch her scream, “You are the problem!” at a peaceful Hispanic counter protester who happens to be an American Citizen. Dalton makes her disdain for immigrant workers clear while she speaks of Arizona’s Minutemen Project. With cameras still rolling, a counter protester who tries to engage in peaceful debate is called a “mongrel” by another SOS protester. There is footage of SOS protester screaming at the crowd of counter protesters, “You go back to Mexico! This is OUR land! This is not your land!” Surely they must have known that American Citizens with darker skin color than their own received this reception. How does one explain that? And their leader Joseph Turner? Newspapers and message boards won’t print the vulgarities he yelled (“Bring it! —– Bring it!”.. encouraging violence) If video footage isn’t enough, visit Joseph Turner’s website to experience harsher doses in writing.. preferably on an empty stomach. SOS members claim to be patriots in support of immigration reform. Danzas Indigenas monument has nothing to do with immigration reform. Destroying this monument would do nothing for immigration reform, nor does attacking Baldwin Park and Home Depot day laborers. SOS is proud of having accomplished the removal of a billboard in Los Angeles, yet this has done nothing for immigration reform. SOS has caused disruption and racial divide while doing absolutely NOTHING for what they state to be their cause. SOS protesters have cost the city thousands of dollars. This is money that could have been used for programs for children, schools, city improvements, etc. Joseph Turner says he is a “Patriot”… How “patriotic” is Joseph Turner’s admitted goal of inflicting economic pain on Baldwin Park — an American city? 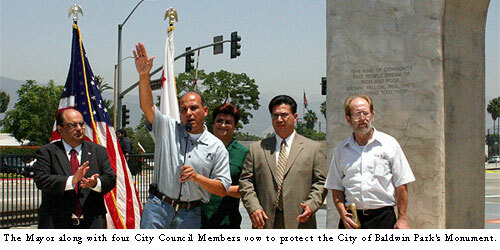 I attended the June 25, 2005 protest. SOS protesters were heavily guarded by police, compliments of Baldwin Park taxpayers. With the extensive security provided to SOS I see no reason why they wouldn’t come back. Perhaps with budget-smart security or having to chip in for the cost of security for themselves, SOS might think twice before returning. Why not have them park where the rest of the citizens and visitors park.. in front of the storefronts of hard-working immigrants? Why not have them pass the residents, visitors, children on the way to their protest destination… and show what “patriots” they are wanting to “inflict pain” on Baldwin Park who has never asked to be attacked by this group? Let them pass the human being they are stereotyping. Surely SOS is aware of the ethnic diversity in California, yet they have targeted one ethnic group in particular. Other than their demonstrations, I would bet that the SOS protesters have never driven through Baldwin Park, let alone know any of my Baldwin Park neighbors who happen to come from ALL walks of life and professions. I was born and raised in El Monte. I am Caucasian and born in the U.S. to parents who immigrated from Croatia, Europe. I have always felt welcomed in Baldwin Park and June 25 was no exception. I observed no “anti-white” or “anti-American” sentiment. Given that this issue has turned racially charged, I did have some concern about showing up and being mistaken for the other side because I am white. But this was not the case. I was as welcomed as always. Everyone was welcomed regardless of what their ethnic background is. I seriously doublt it. Your senseless, unfounded, stupidity reveals your true ignorance. Baca has done more for many communities throughout LA and the country. Your comment is what promotes division and hatred not Baca. Go back to school and learn something meaningful and truthful. By the way, it’s spelled “Cesar”… he wasn’t a salad.